It is snowing & cold here today which is making us want to stay in and hibernate so I thought I would post some favorite hibernation classroom activities, games, books, songs, and crafts. Create “bear caves” in the room by draping large blankets over tables and chairs. Students can place their teddy bears in the caves to pretend they are hibernating. In advance, for each student fold a paper plate in half and staple together along the edges. Cut an opening in one side to resemble the opening of a cave. Copy the sleeping bear pattern below. Played similar to musical chairs but carpet squares are used instead of chairs. Explain to the children that while the music is playing the animals(them) are awake and looking for food. When the music stops it is winter and time to find a spot to sleep (carpet square). As the days go on and the children know more animals you can ask them what animal they are when they sleep. Who Woke the Sleeping Bear? Have all the children sit in a circle. One child will sit in the middle and pretend to sleep all curled up like a bear hibernating. Make sure their eyes stay closed! Pick a child and have them sneak up and touch the bear then quickly return to their spot in the circle. Then everyone in the circle says WAKE UP SLEEPY BEAR! WAKE UP! and the child will then sit up and have to guess who woke them up. Let them guess 3 times. You can vary the game by letting them ask 3 questions such as Was it a boy? Do they have on a red shirt? This hibernation game is interactive and engaging and is included at the end of this Winter Season PowerPoint that has real, full-color photographs so children can relate what they are learning to the real world. Students get to click on (choose) the correct pictures of animals that hibernate. When a picture is clicked either a smiley face correct symbol or an unhappy face “try again” symbol is shown giving students immediate feedback. After being clicked, correct pictures are then marked with a gold star to distinguish them from incorrect ones. 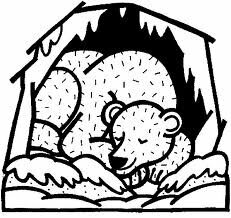 A host of animals find their way into bear’s cave to escape the cold winter as he sleeps. Simple text and photographs introduce hibernation and how some animals prepare for and experience hibernation each year. Old Man Winter is trying to tell Big Bear “Sleep, Big Bear, sleep” because it is time for him to hibernate but Big Bear doesn’t hear too well. He thinks Old Man Winter has told him to drive a jeep, to sweep, and to leap. Students learn about all the different animals that hibernate and how they prepare for hibernation. Introduces students to different types of hibernating animals with rhyming text. Tells how animals cope with winter’s harsh weather (includes hibernation and migration). Explains why some kinds of animals hibernate when the weather gets cold, and shows where different animals hibernate and how they prepare for winter. It’s time for a long winter nap. But just like your students might do every night, these animals keep busy trying to stay up just a little bit longer. Follow a bear cub and its family as they prepare to hibernate for the winter. Also includes learning activities. Explains the amazing ways hibernating animals spend the winter. Story of a little dormouse and his frantic search for a safe place to hibernate. This book shows how 13 North American animal species survive the winter. They do not all hibernate but I love the illustrations and the additional activities included. Snug and warm. Snug and warm. Oh, no! Whoa! Agh! let’s get down!